Airbag Mondo Cretino 2000 Youtube, Spotify Pop-punk cover. (covered as "Sei Gia Di Un Altro") Sei Gia Di Un Altro single 1978 Youtube, Spotify With Italian lyrics by Pantros (Armando Sciascia). Bay City Rollers Dedication 1976 Youtube, Spotify Straightforward cover. The Beach Boys and Lorrie Morgan Stars And Stripes, Vol. 1 1996 Youtube Lorrie Morgan takes lead vocals on this country cover. Reached 73 in the US Country chart. Big Star Thank You Friends: The Ardent Story 2008 Youtube, Spotify Acoustic demo. Also appears on Big Star's Complete Third album. 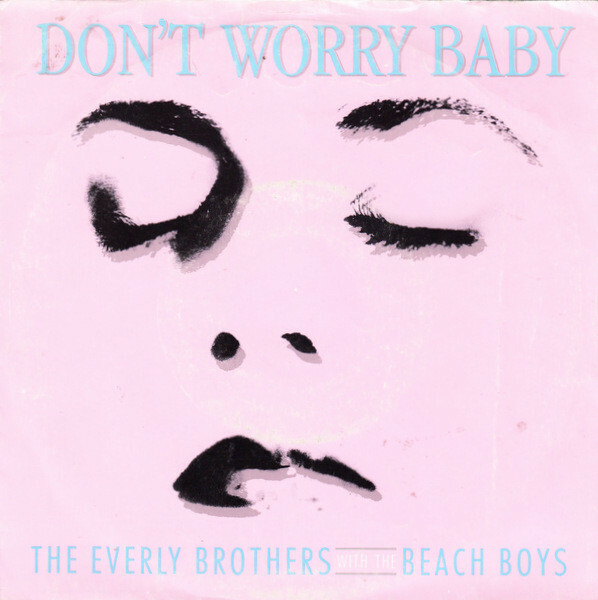 California Music Don't Worry Baby single 1974 Youtube Bruce takes lead and produces. This version has some new lyrics in the verses. The first single on Bruce's Equinox label. Was also the B-side to the "Why Do Fools Fall In Love" single, which Brian produced. Charlotte Cooper Goes Without Saying 2006 David Marks and Jeffrey Foskett are credited with backing vocals for the album. Susan Cowsill Blue Rose Nuggets 9 2004 Youtube Pop cover. Rivers Cuomo Alone II: The Home Recordings Of Rivers Cuomo 2008 Youtube, Spotify Home recording from 1992. The Di Maggio Connection The Route Of Time 2010 Youtube, Spotify Punk cover. Dump Cosmic Slop 1995 Youtube Acoustic cover. (covered as "Sei Già Di Un Altro") Equipe 84 1965 Youtube, Spotify With Italian lyrics by Pantros (Armando Sciascia). Released as a single. The Everly Brothers and The Beach Boys Some Hearts... 1988 Youtube The Beach Boys contributed backing vocals. It was released as a single (in some cases with a rather odd piece of cover art), and performed "live" (quotation marks fully intended) in a medley with "Getcha Back" and the Everly's "Wake Up Little Susie" for a TV special. (covered as "J'ai Peur De L'ete") J'ai Peur De L'ete EP 1965 French cover. The Firebirds Stars In Stripes 2013 Youtube, Spotify Straightforward cover. The Fun And Games Elephant Candy 1968 Youtube Psychedelic pop cover. Joe Giddings All Themes Considered 2012 Youtube, Other Power-pop cover. Gidea Park Gidea Park 1981 Youtube, Spotify Straightforward cover, released as a single. Grouplove Under The Covers 2015 Youtube Indie rock cover. John Hunter Phillips It's About Time 2006 Youtube, Spotify Straightforward cover. Huntingtons Pull The Plug 2005 Acoustic cover. (covered as "Nosso Trato") Para Os Jovens Que Amam Os Beatles, Rolling Stones E... Os Incríveis 1967 Youtube Portuguese cover. The lyrics by Liberty Padua are based on Pantros' Italian lyrics. The Ivy League This Is The Ivy League Youtube, Spotify Straightforward cover. Jackass Penguins Hourglass 2000 Acoustic cover. Al Jardine, Family & Friends Live In Las Vegas 2001 Live recording. Lead vocal by Wendy Wilson. Billy Joel An All Star-Tribute To Brian Wilson 2001 Youtube Live recording, performed with Brian's backing band. Also appears on Joel's My Lives boxset. Nat Johnson And The Figureheads Wonderful Emergency single 2009 Youtube, Spotify Straightforward cover. Keller & Webb Don't Worry Baby single 1975 Cover of The Tokens version. Kiev Cuando Nieva Parece Doble 2012 Youtube, Spotify Live recording, with Spanish lyrics. (covered as "Sei Già Di Un Altro") Rapallo Davoli TV show 1966 With Italian lyrics by Pantros (Armando Sciascia). (covered as "Restiamo Insieme") Sto Volando Con Te single 1978 Youtube With Italian lyrics by Pantros (Armando Sciascia). Love Society Don't Worry Baby single 1969 Youtube Soft rock cover. Mike Love Summertime Cruisin': The Unforgettable Favourites of Mike Love and Bruce Johnston of The Beach Boys 1996 Re-recording with Adrian Baker. Also appeared on Mike Love, Bruce Johnston and David Marks Of The Beach Boys Salute NASCAR. Apparently the only track Bruce actually contributed to - playing keyboard. Maniacs Don't Worry Baby single 1966 Youtube Straightforward cover. Michael McDonald and Billy Preston Musicares Presents A Tribute To Brian Wilson 2007 Live cover. Keith Moon Two Sides Of The Moon 1974 Youtube The album version has Moon singing the vocals low, and the single version had him singing the vocals high. Supposedly, hearing this version made Brian "break down". Muddy Suzuki Stopgap 2013 Other Straightforward cover. The New Tokens Little Darlin' single 1985 A cover of The Tokens version. Oceanss The Psychedelic Sounds Of TBTCI, Volume III 2015 Youtube, Other Noise cover. Papa Doo Run Run California Project 1985 Youtube Straightforward cover. Features Mike Love on the middle-8 vocals. P.J. Proby I Am P.J. Proby 1964 Youtube, Spotify Straightforward cover. Programmar Somaphone 2: Grammar Sings The Classics 2004 Youtube, Spotify Beatboxing cover. Instrumental version here. Terry Reid Live In London 2013 Spotify Eight minute acoustic live performance. Erica Smith and The 99 Cent Dreams Snowblind 2008 Youtube, Spotify Pop cover. Ronnie Spector She Talks To Rainbows EP 1999 Youtube, Spotify Brian originally wrote "Don't Worry Baby" as a follow up for The Ronettes hit "Be My Baby", but producer Phil Spector rejected it. B.J. Thomas B.J. Thomas 1977 Youtube, Spotify Including new lyrics. Released as a single, which hit #17 on the Billboard Hot 100, #2 on the Billboard Adult Contemporary chart and #12 in Canada. The Tokens Vintage Edition 1988 Youtube, Spotify Re-recording of The Tokens cover version. The Tokens Both Sides Now single 1970 Youtube, Spotify With lyrical alterations by The Tokens (Mitch Margo, Phil Margo, Hank Medress and Jay Siegel). The Treetops Don't Worry Baby single Youtube Straightforward cover. Appears on the No-Go Showboat - 20 Beach Boys Cover Songs compilation album. (covered as "Sei Già Di Un Altro") 29 Settembre 89 1989 Youtube, Spotify With Italian lyrics by Pantros (Armando Sciascia). Released as a single. Joseph Williams Smiles 2007 Youtube, Spotify Piano-based cover. Brian Wilson feat. Sebu Brian Wilson And Friends 2016 Live recording. DVD only. Sebu takes the lead. Wilson Phillips Dedicated 2012 Youtube, Spotify Acoustic cover. Tatsurō Yamashita Add Some Music To Your Day 1972 Youtube Straightforward cover. Zed This Little Empire 2003 Youtube Rock cover. Is there a cover of "Don't Worry Baby" missing? Please get in touch.